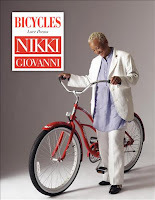 Nikki Giovanni remains one of the best-selling American poets. No question, we had to include her work in the mix for our Promise of Poetry Project. Here's a blurb about Giovanni's Bicycles: Love Poems written by a reader at one of our earlier browsing sessions. Bicycles is heartfelt, true, and real. It is a portrait of the ambivalence of love--love that excites, regrets, hopes, saddens, heals, hurts, lasts, ends, and just feels. Poems like “Give It A Go?,” “In Simpler Times,” “If Only,” “A Drunken Phone Call,” “Why Don’t You Love Me,” “Your Shower,” “I Like the Dance,” and “I Am Jazz” are not just the sentiments of love, but the workings of Giovanni and her journey as a poet and a person, a journey not so unlike that of riding a bicycle. --C.B. We had another browsing session today with a group of first-year collegiate African American men. I posed the questions: Of the books you've looked over, which one did you decide to look at closely, and why? And here's a response on Giovanni's book from one of the young men. Bicycles: Love Poems. I am more of a romantic type guy. So I browsed through one of the poems in the book and this book was clearly me. --M.J.